On August 17th of last week, we decided to climb Wetterhorn peak. You might be thinking…”you went to Switzerland! ?” But, no in fact, we made a relatively easy 5 hour drive to the San Juan Range of Colorado and set up “camp” in Lake City, Colorado. 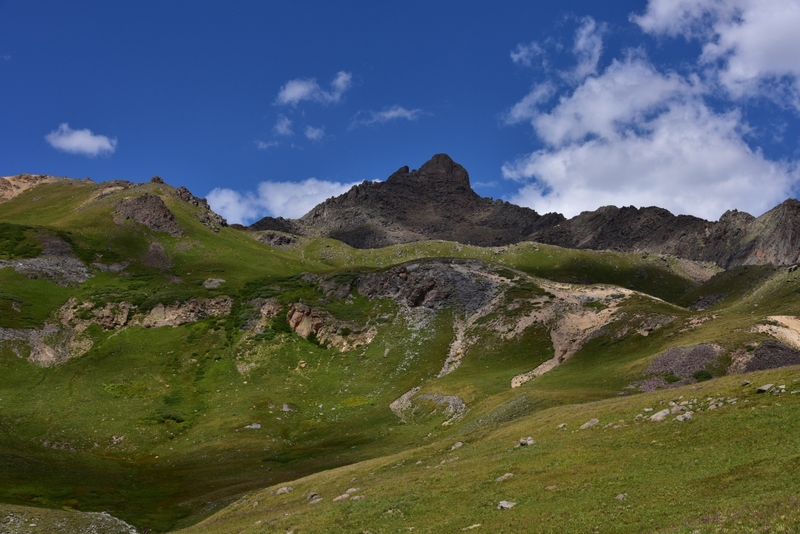 The 14er Wetterhorn in Colorado is named after its European counterpart in the Bernese Alps. 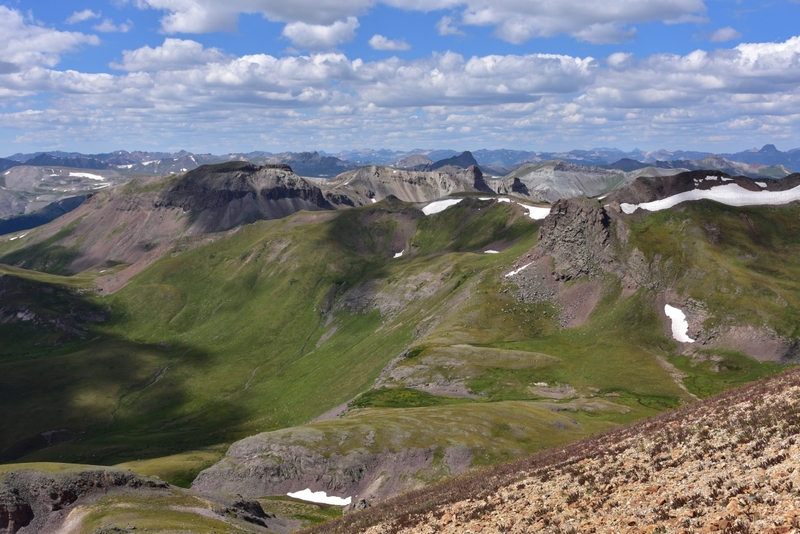 Members of the 1874 Hayden Geological Survey recognized similarities between the distinctive summits of these peaks. Though more photographed, Swiss Wetterhorn only reaches 12,000 feet compared to our Wetterhorn at just over 14,000 feet. 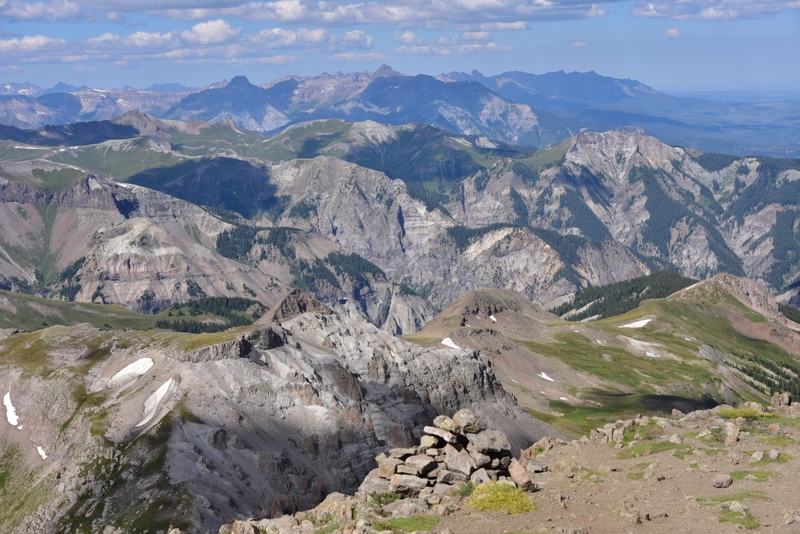 Our peak is is probably less photographed due to the relatively hidden nature of our peak in the rugged San Juans. We say “camp” loosely as we stayed comfortable and dry in the Cannibal Cabins in Lake City to get some adequate rest. We’ll get to the name later, and the town’s odd obsession with a fellow named Alfred Packer. Our alarm went off at 4:45 am, and we quickly gathered our gear in the cold, dark morning. Though warmer than outside, we failed to turn the heat on in the cabin during the night and woke up to a crisp chill as we donned our climbing clothing. 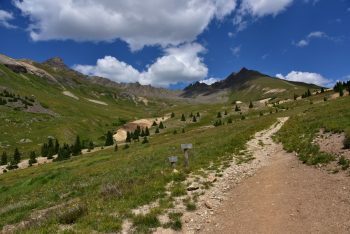 We hit the alpine loop in the dark and followed the gravel road for 9 miles before turning off onto the 4-wheel drive road, North Henson Creek Rd. Thankfully, the sun began to rise once we reached this terrain. 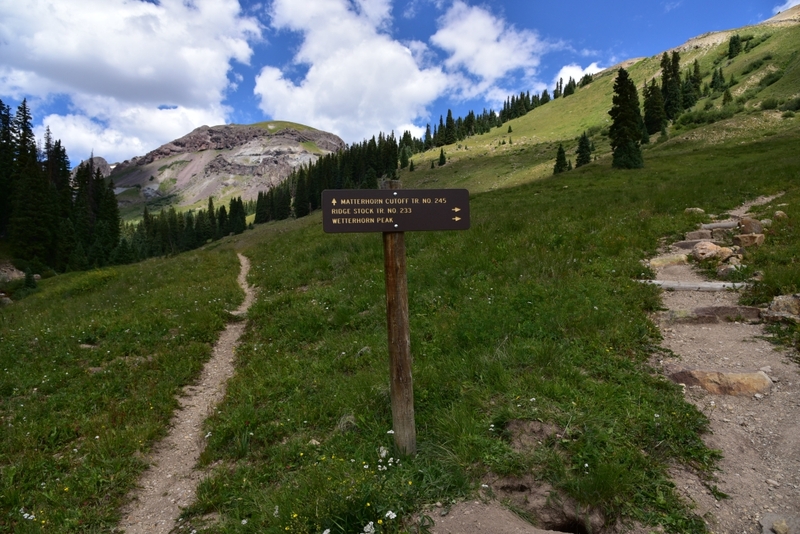 The first two miles were relatively tame, but the final 0.7 mile to the upper trailhead was rough and narrow. It should be noted that there is some parking below this final section for vehicles that don’t have enough clearance. We were just fine in a stock Xterra though careful negotiation was required in two to three sections. We began our ascent of Wetterhorn around 6:30 am and hiked easy terrain for the first 0.75 miles or so to a junction where we went right. We passed through some trees and saw a few campsites before the trail opened up to a gentle hillside. Around 12,000 feet, we reached another junction and followed the trail left towards Wetterhorn peak. At this point, we still had the trail completely to ourselves. 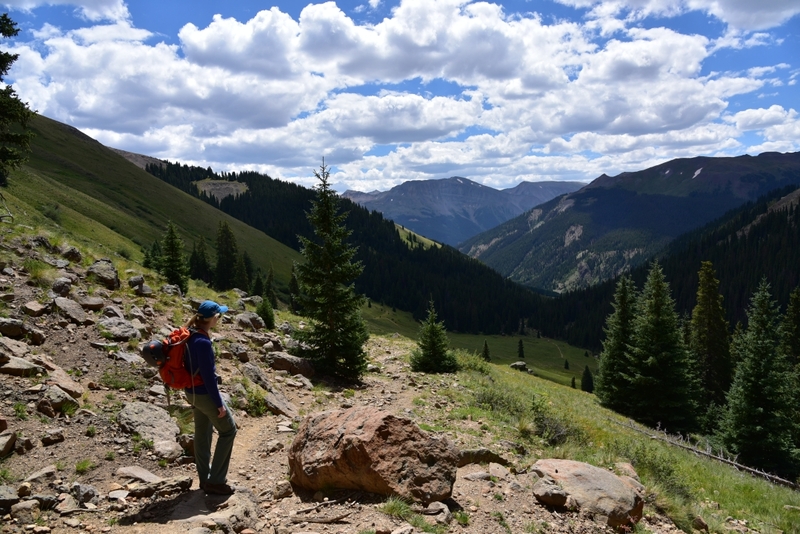 It was so quiet and serene in the remoteness of the San Juans. 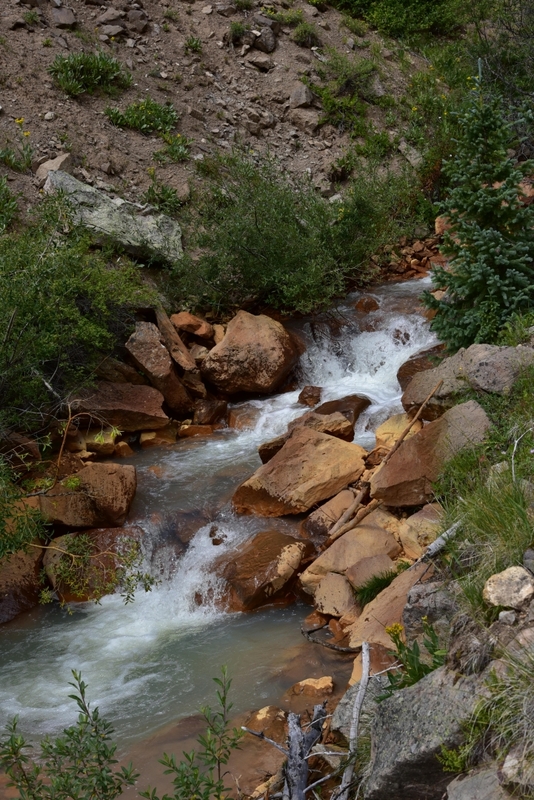 We continued to gain elevation, though it felt really gradual on this portion of the trail. 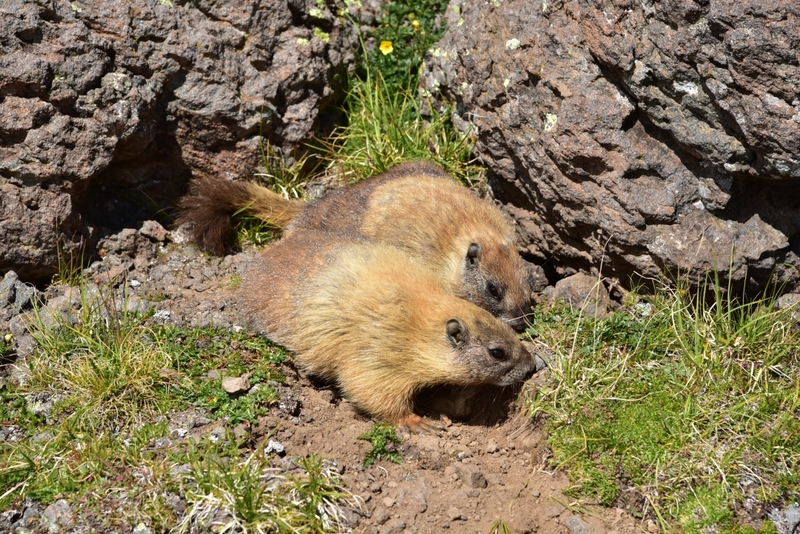 As we reached a boulderfield, the terrain got a bit steeper, and the marmots began to make their presence known. They popped up amid the rocks and flora and stared us down. We also saw a chubby little Pika scurry in our path, its mouth full of a collection of various grasses. 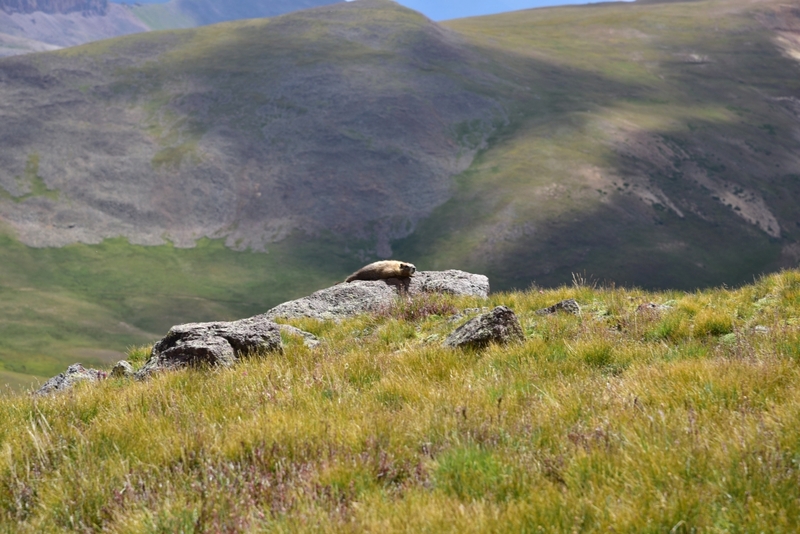 It was fun to see so much wildlife on the hike, however we were told by folks in town that these little critters (marmots) enjoy chewing the straps off of day packs and the handles off of hiking poles whenever you let your guard down. In between all the critters, we looked up and were greeted with outstanding views of our objective. We continued upward through rocky terrain and reached the ridge to the summit and the “yellow” dirt that marks the start of the more difficult terrain. 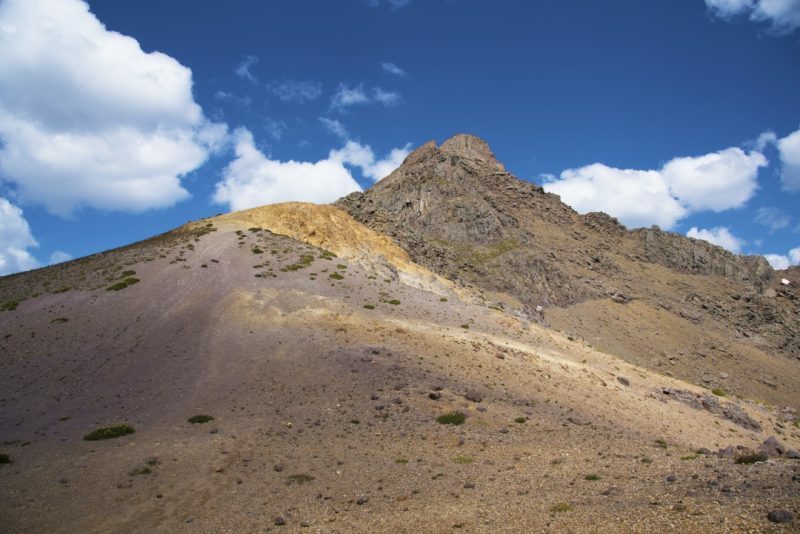 The yellow dirt was a collection of loose dirt and scree and not very enjoyable to ascend (descending it was worse). We quickly worked our way past the dirt to reach the part of the climb we had most been looking forward to: the class three terrain. 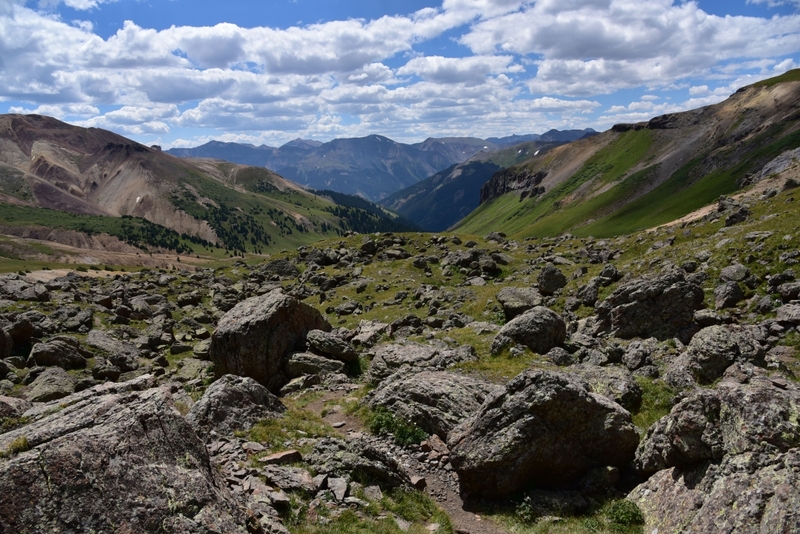 Here, we were at approximately 13,200 feet and had less than a mile to the summit. 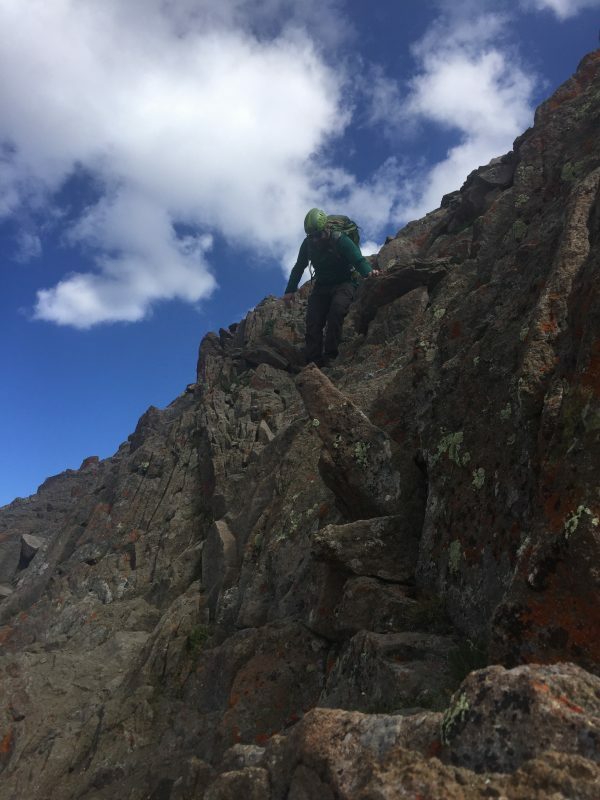 We navigated the left side of the ridge on a faint, broken trail through difficult class 2 terrain before reaching our first class three climbing. We reached a “rock rib” which blocks easy passage. We climbed upward and bypassed it via a v notch on the left. 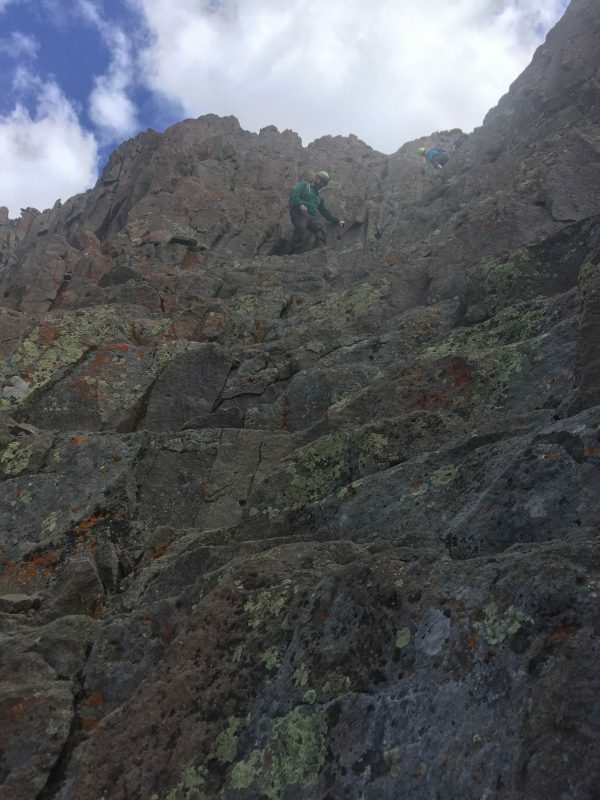 It was easy, but fun climbing, and the notch was not difficult to spot, though we studied pictures of the terrain in detail before our attempt. There is also another option for bypassing this feature that we utilized on the way down. 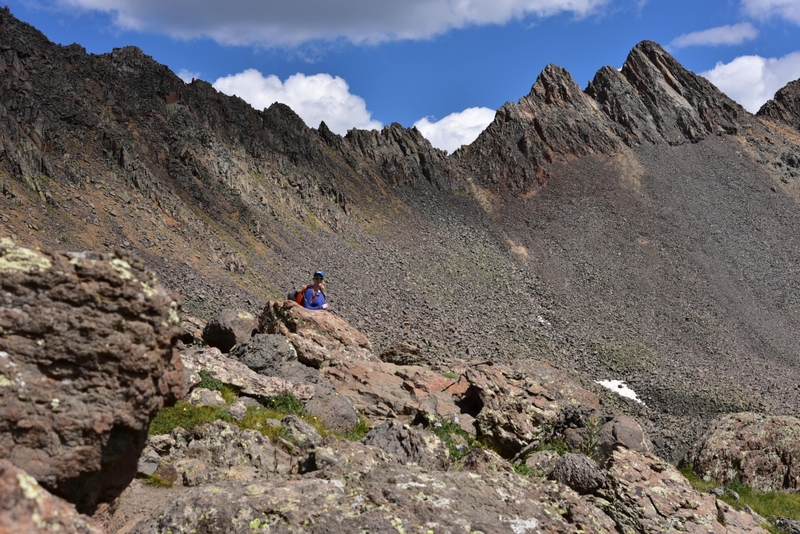 Instead of going through the v-notch, you can also climb over some rocks to reach the ridge crest. Both options were fun. Most this portion of the climb can be seen in our go-pro video as we really needed our hands and couldn’t take many photos. Once on the ridge crest we continued towards the “prow,”. A distinctive feature of this climb, the prow is a towering fin-like rock feature that mimics the prow of a ship. 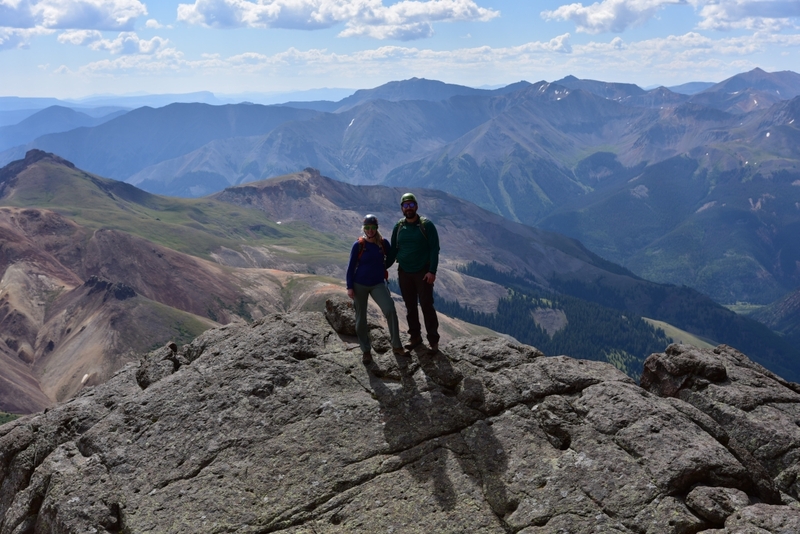 On the ridge crest, we stayed as high as possible and climbed over more class 3 rock to reach the area next to the prow. 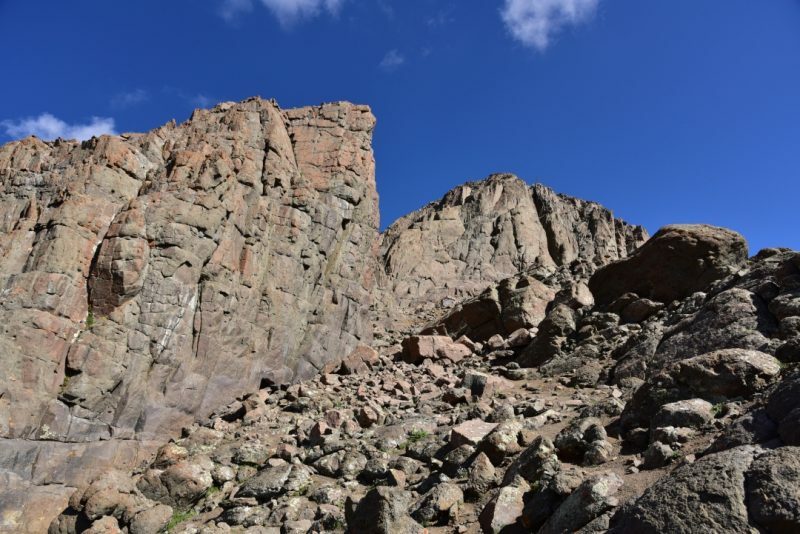 There was a faint trail skirting the left side of the ridge, but the rock was loose, and the bits of path filled with scree. 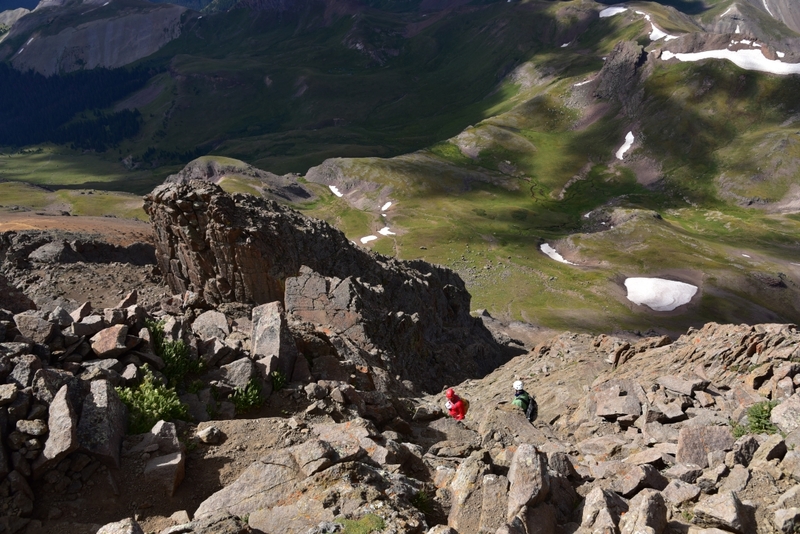 At 13,800 feet, we walked passed the right side of the prow. Near the prow is a flat area to rest and chill out at if one is so inclined, instead of the continuing onward to the exposed final route to the summit. We continued past the prow to two notches leading to an open area below the summit block we can be seen above in the photo on the left. 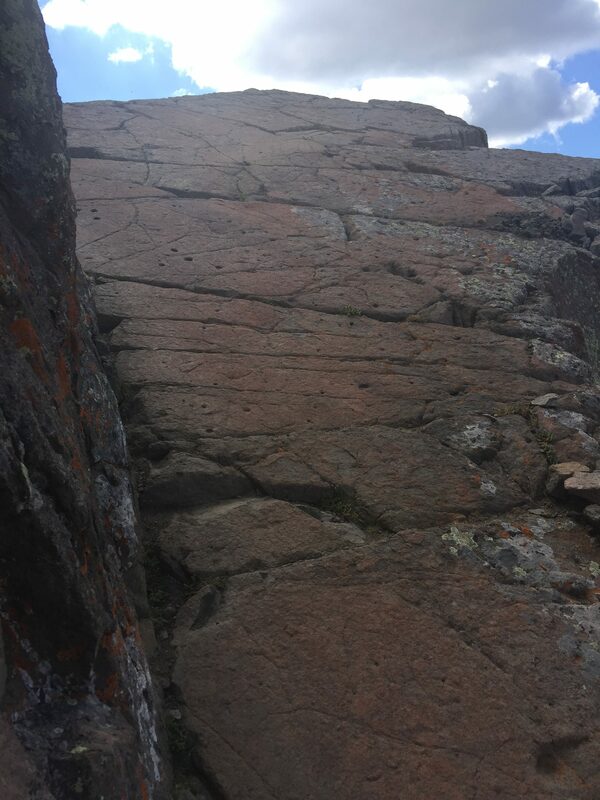 We climbed up and through this obstacle to reach a polished rock ramp slanting downward to a narrow ledge that marks the start of the over 150 foot “staircase” to the summit. The exposure here is quite intense but the rock is stable and climbing relatively easy. 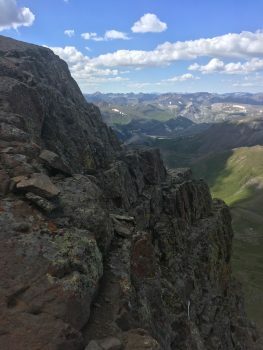 Essentially, it is a series of knee to thigh high ledges with plenty of solid handholds. Both of us wore helmets, as rock fall could potentially be a hazard from climbers above. Seen below is the ramp leading to the most exciting part of the climb and the exposure looking back behind it once you have reached the ledge to start the climb. Our video we made of this hike begins here at “the Prow.” Check it out below! About halfway up, the crux of the route mimics an amphitheater with several wider ledges in an arc shape facing the vast terrain. Here, we followed a narrow ledge towards the left and then proceeded to climb the final 50 feet up slightly easier terrain. The photos below are from climbing up the staircase. We popped up on the summit and joined two other climbing groups. 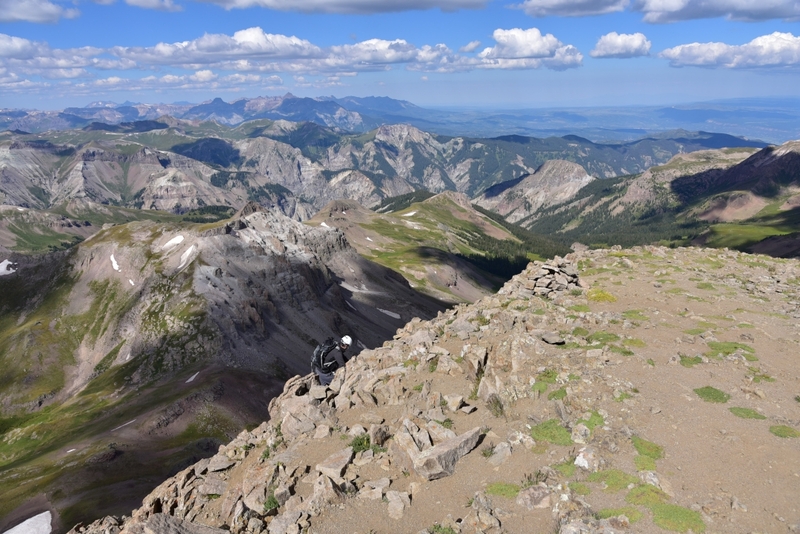 We spent about 15 minutes enjoying the truly amazing views of the Uncompahgre Wilderness and the rest of the San Juan range. The colors were amazing. Bright green grass, red and yellow rock, and a brilliantly blue sky peppered with fluffy white clouds filled our vision in all directions. 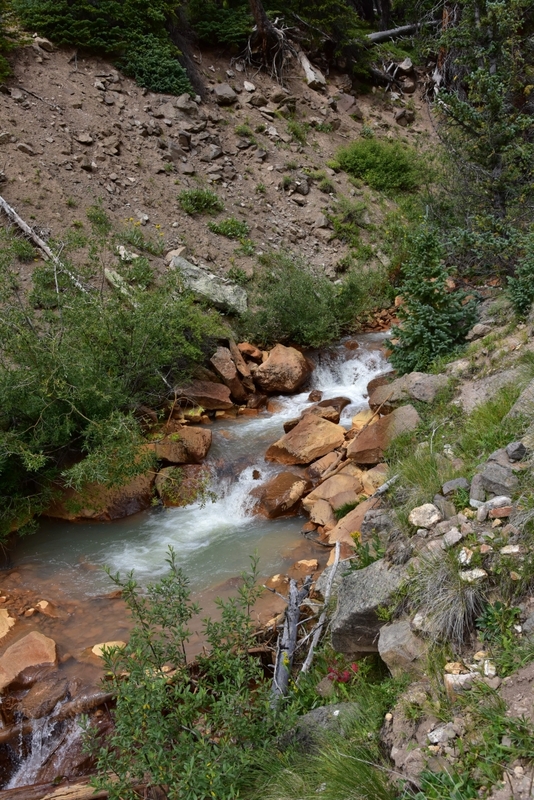 Despite enjoying our accomplishment and the wonderful scenery, the nagging thought of the down climb kept plaguing us. We waited for the other groups to safely descend the peak before we started down. The first 50 feet down towards the ledge didn’t require us to face inward to the rock, but after we reached the ledge and area that looked like an amphitheater, we faced inward to safely reach the bottom of the stairs. The downclimb felt harder than climbing up, but we managed just fine and reached the slanted slab in no time. Once we were on less exposed terrain near the prow, we paused for some food and photos that some fellow climbers took for us. The remaining downclimb was uneventful, but nonetheless enjoyable minus the “yellow” rock section. Once off the ridge, we took our time getting back to the truck and took many photographs and enjoyed our time in the backcountry. On our way back, features that were hidden in the darker morning appeared to us more clearly. 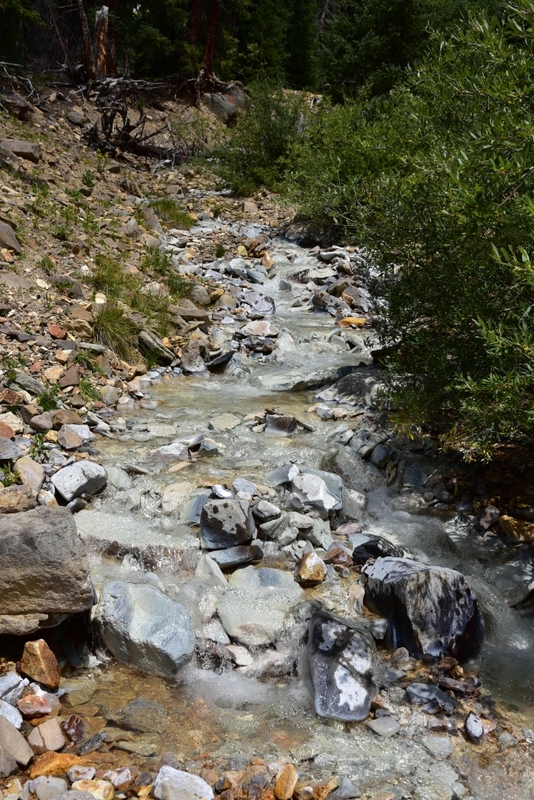 Several of the creeks we hiked by appeared a unique whitish blue color that can been seen below. We are still in the midst of researching why the water and rocks are so uniquely hued and will update at a later time. We reached our truck, ready for some food and relaxation. Despite the relatively short hike and climb (approximately 7 miles RT, and 3,300 feet of elevation gain), tiredness set in. The peak was, after all, a bit mentally taxing with all the exposure. It took us about 45 minutes to get back to Lake City where we stopped at Southern Vittles for some amazing food. (Just about everyone in Lake City is from Texas) so they know good food. 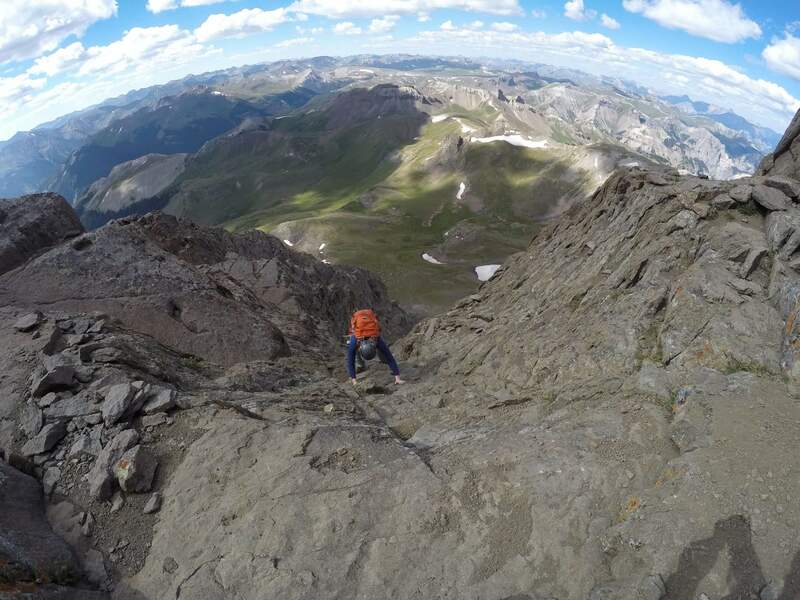 Wetterhorn peak was an extremely fun class 3 climb with spectacular views. It provided much needed adventure and a step up from an everyday hike. Nonetheless, those attempting it should be comfortable with class 3 climbing and enjoy great exposure. There is a also a bit of route finding necessary on this peak to keep the terrain on the easy side. Now, back to the “cannibal” cabins thing. 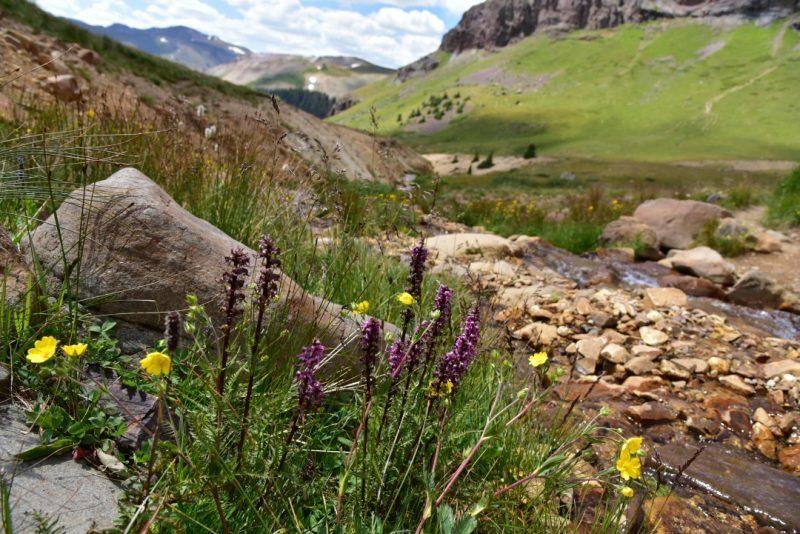 Way back in 1874, good ole Alfred Packer (an American prospector) attempted to travel through the southwestern colorado mountains in an extremely harsh winter. Essentially, he took 5 men with him and only he returned to Lake City. He at first claimed that the group left him, but inconsistencies in his story emerged and eventually he admitted to living off the flesh of his companions to survive. Apparently the remains of the men in his group were found just outside of Lake City, and the town can’t seem to shake this event. There is a restaurant called Cannibal Grill and Packer Saloon and of course our cabins. Despite the creepy name, the restaurant and saloon are really fun with great food and an amazing patio with live music. The cabins are quaint and clean. 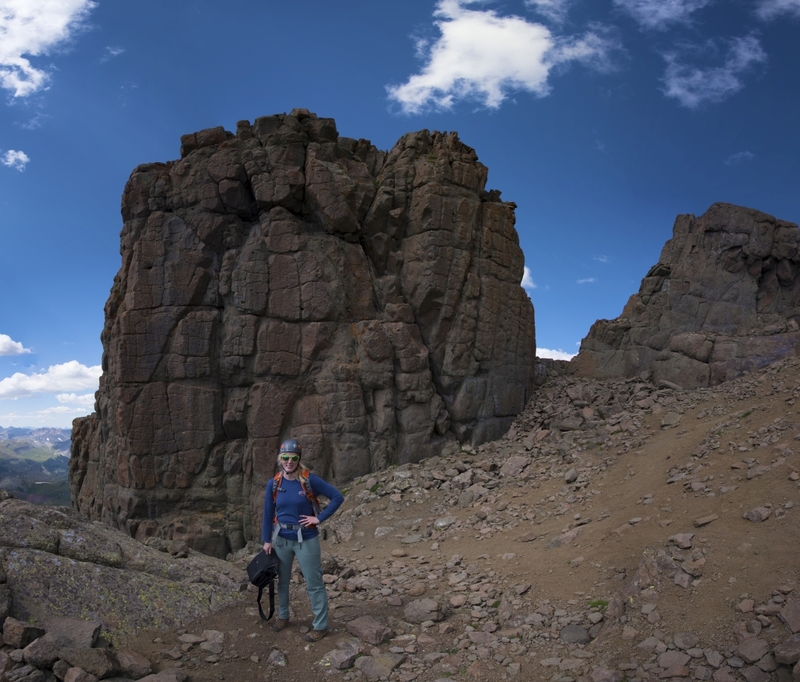 Stay tuned for our a trip report from our second peak of the trip, Handies Peak. This climb seems to be extremely challenging! spectacular! I enjoyed my “virtual” climb!